Chairman, Nigerian Union of Local Government Employee (NULGE), Ayedaade Local Government Area of Osun state, Tajudeen Alabi was reportedly burnt to death on Thursday in domestic fire outbreak. 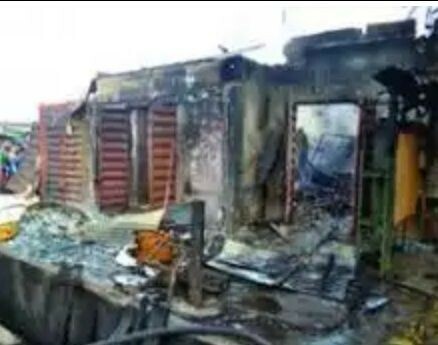 The NULGE Chairman, was killed when fire engulfed three shops closed to his residence located at Odeyinka road, Oteyemi area, Ikire, a town located along Ibadan Ile-Ife dual carriage way. Alabi was said to have died immediately after the fire incident while his belongings, worth millions of naira were destroyed in the process. A resident, simply identified as Yinka said, the fire started around 1 am, following what he called “power surge” when the public power was restored to the area. “We were all asleep when they brought light around 1 am yesterday. We heard people screaming and shouting for help, but the locked shops and the deceased’s house hindered us from getting close to the scene. “We initially thought it was something else but when we saw smoke, we forced the door open and boys in the area poured water to quench the fire. Speaking on the incident, former Executive Secretary, Ayedaade Local Government, Oduwole Basiru Iyanda described the incident as unfortunate. He described the late NULGE chairman as nice, loving and jovial. He, however charged people of the state on the need to always be cautious of fire, saying they should be mindful of their electrical appliances. This is not the first time unfortunate incidents such as this would happening and it may not be the last unless somebody is made to pay for his or her negligence.